We’ll begin by saying any piano you have to move is best off moved by a professional piano mover. Easily weighing hundreds or even close to 1,000 pounds, pianos have a lot of intricate parts – any one of which could break off or get dented. Not only is your piano heavy and fragile, it’s also expensive and sentimental. Legs that break off, keys that fall out of place or sides that get dented can all be very costly to fix. On top of that, you could hurt your back or neck. Professional movers come equipped with all the right equipment to get it done safely with no damage. That being said, if you’re still kicking around the idea of a DIY piano move, here are some tips. Pianos are very top heavy, with light and delicate legs. If you want to successfully move your piano, you’ll first have to understand how its weight is distributed so you can maintain its balance throughout the move. 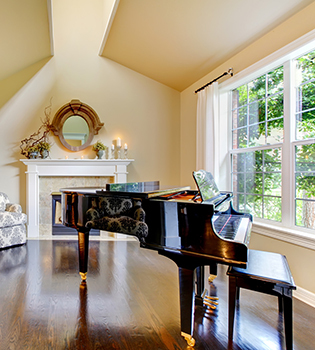 You shouldn’t just be concerned with the piano’s surfaces getting scratched. There’s a whole world of intricate pieces inside that need to be protected too. For the average size piano, you will need at least four people: two to do the lifting and two to handle the equipment, guide you along corners and get you safely to the moving truck. Make sure everyone on the team wears safe, sturdy, comfortable shoes (preferably sneakers), with no dangly jewelry or accessories. You’ll need to gather the right supplies and gear, such as heavy-duty furniture straps, two dollies and heavy blankets. Take the legs off and move them separately. Close the lid and lock it, stuffing it with a blanket for extra protection. Drape and tape the blankets over your piano. Maintaining balance will reduce the chance of interior damage. Your two lifting people should be holding each side of the piano, with a furniture dolly under each. Then, roll the piano gently out of the home and to the truck. It’s better if you have mapped out an escape route beforehand so you don’t have to make crucial directional decisions on the fly. Get the piano as far back into the truck as possible, which means it should be the first item you load. Place as many boxes around the instrument to give it extra support. Tuck soft items around it so it stays snug. Make sure you know where your piano will be placed before you start moving it. Choose a spot next to an inner wall to protect it from moisture, mold, and cold air. Make an appointment for your piano to be tuned, but put it off about a month. It will take that long for the piano to settle into its new environment; therefore, tuning the piano too soon will be ineffective. Moving a piano is harder than you think. Save yourself a lot of time, headache, and money, and contact us at 210-722-1322. We will bring the skids, dollies, straps, pads and tools to make the job go smoothly and safely.